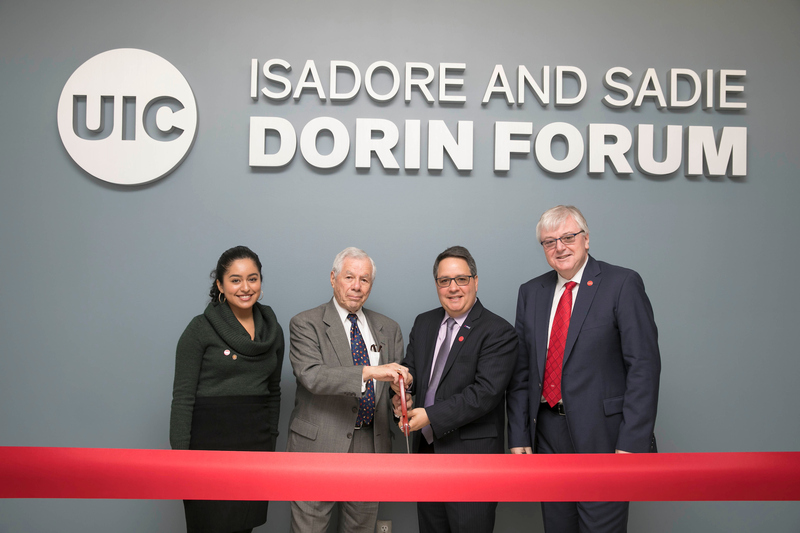 UIC officials and members of the Isadore and Sadie Dorin family celebrated the ribbon cutting April 22 of the Isadore and Sadie Dorin Forum at UIC. Last fall, the Isadore and Sadie Dorin Foundation donated a $3 million gift to UIC, and campus officials have recognized the foundation’s generosity with a term naming of the UIC Forum as the Isadore and Sadie Dorin Forum at UIC. The gift will also establish a permanently endowed fund to provide scholarships to undergraduate students from Cook County. The ribbon-cutting event brought together members of the Dorin family to thank them and celebrate the impact their gift will have on UIC students. “UIC is proud to be stewards of the Dorin family legacy and very grateful for the foundation’s generosity,” UIC Chancellor Michael Amiridis said during the event. UIC student trustee Karina Reyes thanked the foundation on behalf of the students body. “Thank you for allowing us to be part of the Dorin family legacy — a legacy of resiliency, tenacity, strength and compassion for others,” she said. Isadore and Sadie Dorin were teenagers in the early 1900s when family contacts in the United States offered them refuge on the West Side of Chicago from the devastation of the Russian Revolution and the anti-Semitism in Europe. In this country, Isadore and his wife Sadie, who arrived separately and met in Chicago, were able to earn enough money running a produce store to raise their five children, Leah, David, Bingy, Mollie and Bud, during the Great Depression. The family was raised near what is today the University of Illinois at Chicago’s campus.